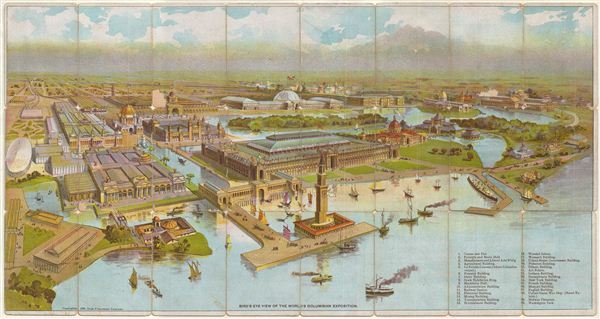 Rare view of the 1893 Chicago Columbian Exposition in a series of trade cards - from the Charles Rand Penny Collection. Bird's Eye View of the World's Columbian Exposition. A scarce and remarkable discovery, this is an 1892 bird's eye view of the Chicago World's Fair or World's Columbian exposition. The view, prepared by Star Publishing Company, is a chromolithograph production printed onto the backs of 24 trade cards which can be assembled into a single image - as above. Important buildings and exposition halls are noted numerically with a key appearing in the lower right quadrant. Guests to the fair were encouraged to buy or trade the cards until the full view was able to be assembled - like a puzzle. The verso features an assortment of smaller black and white views focusing on individual buildings and suggests that these may have been part of a larger set though the view itself is complete. The 1893 Columbian exposition or Chicago World's Fair was a pivotal moment in the history of the United States. Chicago won the right to host the World's Fair over New York, Washington D.C., and St. Louis. During its six month run, nearly 27,000,000 people, roughly half the population of the United States at-that-time, attended the fair. Its numerous displays and exhibits established conventions for architecture, design, and decorative arts, in addition to initiating a new era of American industrial optimism. Printed by Star Publishing Company in 1892 - one year before the fair was opened. From this we may assume that not all of the buildings were complete when this view was drawn. It is further of some note that this piece was deaccessioned from the well-known Charles Rand Penny Collection of World's Fair memorabilia. We have identified no other examples of this set or even individual cards from this series in any known collection, public or private. Very good. Some cards exhibit soiling and edge wear, particularly card 3 from top left (see bottom right corner of card). Printing on verso. Cards have some tape on verso used to hold together at corners - could be easily removed.